After I got the 11/44 and my RL02 running, the CPU backplane was full. The KD11-Z backplane has only one hex and one quad SPC slot empty, but I planned to use an SMD disc, and SDI disc with UDA50 controller and DEUNA network. So I had to get the 2nd backplane in my 11/44 connected to the first one. 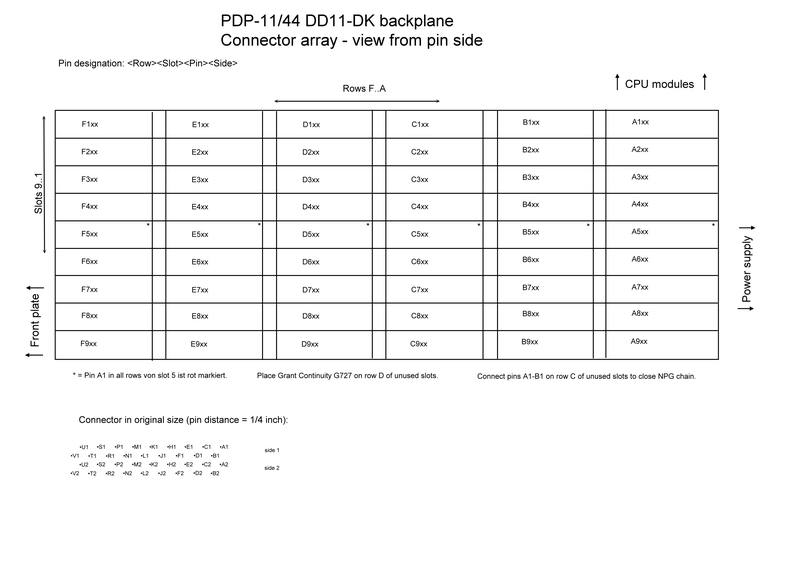 This was a 9-slot DD1-DK standard backplane. I had to build a system, which spans over two backplanes. DECs packing philosophy is very modular: backplanes can be added to mounting boxes, as long as there are free power supply resources and mounting space. Backplanes are either of generic type, with a max of 9 quad and hex SPC (Small Peripheral Connector) slots, or they come prewired for older device controllers, which consist of many logic cards, or a mix of both. Using the additional backplane was not very intuitive the first time. While the backplanes slots appear as homogenous array, they have a sophisticated internal structure. At first I needed a UNIBUS connector to connect both backplanes. I had no M9202, but four 10-feet cables, and needed a short 2-5 inch cable. One of my long cables was damaged, so I cut off one connector and soldered it to the other one in a short distance. It was no fun: the flex print plastic shields melted immediately as I touched them with the solder iron, and the cable wires loosed their alignment. Finally it looked ugly, but did its job. Never mount a terminator in a “Modified Unibus Slot”! I connected both backplanes with my jumper cable on row A (right), and powered on: “?22 CPU hung”. Oh well, I missed the UNIBUS terminator. I eagerly plugged the M9302 terminator next to the jumper ... power failure! I ignored this because I have a 11/44 (and not an 11/03 or ‘34) but began to suspect that they were talking to me. Indeed: The only free Standard Unibus slot you can plug the terminator into is the last slot in row A/B, all others are ... Modified Unibus Slots. Well, just my pride was hurted. I put the M9302 in the last slot, powered on: CPU did not respond. In DECs documentation. and in news groups I often read about the interrupt handshake signals: BR, BG, NPR, NPG and GRANT and ACK and such things. I found that empty backplane slots (and I had 8 of them!) have to be bridged: At first you have to plug G727 GRANT CONTINUITY cards in row D of every empty slot, something I could accept. But I had not enough G727 cards (I bought a rather filled up machine! ), so the usual search+buy+pay+wait cycle began once more. Finally my backplane was full of G727, I powered on ... “?22 CPU hung” again. Aaargh ... but wait: G727 closes the Bus REQUEST GRANT, but there is also this NON PROCESSOR GRANT signal. Documentation said: I had to close the “NPG jumper” on those backplane slots, which do not contain a card with active data transmission (DMA). The four cards I wanted to plug in were all DMA capable (disc controllers and network adapter). By todays standards “Closing a jumper” means you would expect a printed circuit board with a little 2 pin header, which has to be short cut with a little rectangular jumper plug. In the 1970’s this means, you have to get your wire-wrap tool (you have one, don’t you?) and wrap a short piece of wire between two wrap posts. All this is done on the backside (Pin-Side) of the backplane, so I turned my 11/44 upsize down and removed the bottom cover. What a sight: An unstructured monstruous array of 9 slots * 6 rows * 2 sides * 18 contacts = 1944 pins! DECs four-dimensional pin-coordinates-nomenclatur (as in “Ground is on pin A 12 T 1”) should have warned me. To check the NPG jumper I had to find row C, Pins A1 and B1 in each slot. I made a survey map and pin rulers in 1:1 scale, and began counting. I found that 4 rows were without NPG jumpers, which was luck because I planned to put just four cards into the backplane: I could use the slots where NPG already was open. So no wire wrapping was needed (I would have done it without wire-wrap tool): After I plugged my four cards into the four NPG-open slots, the CPU started again! Later I learned how to make an NPG jumper with modern tools. You can plug a standard female pin header onto the wire wrap pins, the distance between two diagonally arranged wire-wrap-pins is just 2/10 inch = 200 mils (see a DIL-EEPROM as reference).